On Monday, August 1st, four federal agencies celebrated National Whistleblower Day with an event sponsored by the Senate Whistleblower Protection Caucus. This was the first time any federal agencies have ever recognized Whistleblower Day, although the U.S. Senate has passed a resolution four years in a row proclaiming July 30th as National Whistleblower Day. The speakers included Michael Horowitz, the Inspector General at the U.S. Department of Justice and Chair of the Council of the Inspectors General on Integrity and Efficiency, Carolyn Lerner, the head of the Office of Special Counsel, David Michaels, the head of the Department of Labor’s Occupational Safety and Health Administration, FBI Director James Comey, as well as Delisa Lay and David Berick of the offices of Senators Grassley and Wyden. Their remarks focused on the current issues whistleblowers face, and all of the speakers recognized that much more needs to be done to protect and encourage whistleblowers. FBI Director James Comey expressed the need to change the culture and reform the whistleblower protection system at the FBI. Comey acknowledged the Bureau’s very serious problem when it comes to whistleblowers and stated a commitment to setting the tone at the top that whistleblowers should be listened to and protected. Comey specifically referred to Robert Kobus, who spent 9 years fighting a whistleblower case because he did his job by reporting waste and fraud at the FBI. Comey praised Kobus for doing the right thing even though Kobus was assigned to work on an empty floor in the FBI’s New York Field Office as retaliation and Comey said it took too long for Kobus’ case to be resolved. We contacted Robert Kobus to get his reaction. “I very much appreciate the Director’s comments, but I also hope Congress passes the FBI whistleblower reform bill so other FBI employees don’t have to wait 9 years to obtain justice after blowing the whistle,” Kobus said. 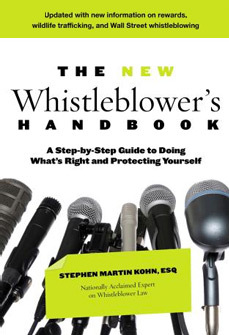 “We need to ensure that changes are made at the FBI to fix their whistleblower protection system,” Kobus added. Fortunately, a bill is currently being advanced to fix many of the problems, which you can support here. “This event demonstrates the importance of establishing National Whistleblower Day,” said David Colapinto, NWC General Counsel. “We need laws to improve whistleblower protections, like the FBI reform bill, but we also need agencies to recognize the need to change a culture that is hostile to whistleblowers,” he added. Is the Proposed Sentence for NSA Whistleblower Reality Winner Too Harsh?